Discovered at Winterborne, Monkton, Wiltshire, UK, 15 July 2001. Translation by Suzanna Maria Emmanuel with guidance from the Star Beings of Love who desire to teach us love and light consciousness. Namaste. This is a very special transmission from the star beings who desire us to awaken to what we have within us. They desire us to awaken to our greater love consciousness, so that we begin to remember our greater path, first individually and then grow strong, collectively. This crop circle illustrates our programs within us which are our shadow programmes and also our light programs. Each one of us is connected to light, as shown by the yellow parts, and is part of Divine Universal thought, which is shown by the yellow outline of the circle. Please note: The yellow light is the violet flame of healing for ascension. The violet flame transmutes lower energies and brings energies to a higher state of healing. The whole circle swirls and rotates constantly. The blue parts are our unevolved shadow parts that need to come into the light to become more highly evolved and healed. The light parts within us are our loving parts. They have a loving, mothering energy for our shadow parts, if we desire to become healed, as shown by the love connection within the crop circle. Our loving parts operate at a much higher frequency than our shadow parts and we are here to transform who we are within by taking our shadow selves and loving them, placing love within them to raise the vibration of our shadow selves until our shadow selves no longer have hold over us. At that stage of our evolution, we become truly unlimited into our love, power, beauty and greatness. 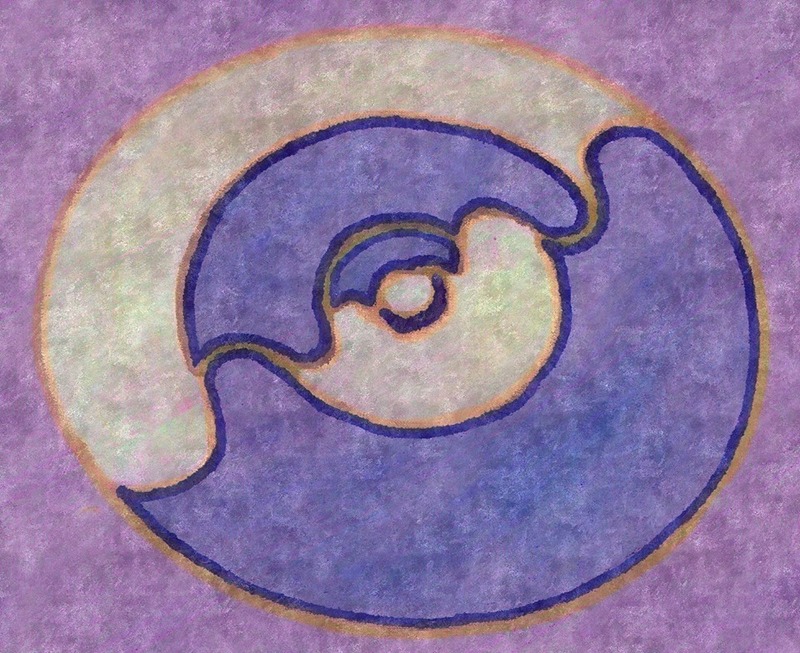 Our shadow selves understand our light parts very well, as shown in the circle with the lines coming so closely, between the yellow selves and the blue selves. However, it may take a long, long time for us to recognize our shadow selves and our light selves and then learn to surrender our shadow selves to the light selves, but once we do, we awaken so quickly and life changes so much (here I would like to add too, that in this lifetime, we are gifted with the great opportunity for our vibrational selves to become so healed in the love flows with the Divine Ascension programme of CAEAYARON, who awakens, aligns and brings the greatest healings possible because CAEAYARON is Divine Love). The closeness of the lines also shows how much our light selves want to heal all our shadow selves, if we allow it to happen. Our light becomes stronger within us once we begin to desire the light parts and forgive the shadow parts within us, for it is then we begin to truly awaken to greater love within us. Once we awaken, we gain a whole new energy within us, which is much higher than the old energy. This is likened, and illustrated also within this image, to our spiritual rebirth where we are born into a greater self with higher frequencies at which point our energies change, our words change, our wisdom changes and most of our love changes. Once our love changes, we send out much greater love via our energy systems, mainly the heart which is so loving once it opens and it expands into greater love and wisdom. This is when we are truly spiritually advancing forward. Slowly, when we heal, our light begins to take parts of the shadow selves and transforms it into the light. The centre part is like the cradle of life and light, slowly changing our consciousness, oh so slowly. Gradually we can change. Gradually we become stronger. Gradually we change our belief systems. Gradually our energetic range changes. At first, before awakening, we cannot understand higher dimensions. However, once we awaken and gain greater frequencies of light within us, we begin to understand deeper processes. This is because our energy frequencies change. The higher we go, the more we can understand and the greater we desire to understand. What is beautiful about this beautiful circle is that it shows a person awakening greater to the light. Before a person awakens there are no great amounts of light running through the shadow selves as the shadow parts need to desire the light programs first to begin the healing process. However, because this person is awakening now, accepting the light, the shadow frequencies have separated from each other and are becoming transformed by the light frequencies, slowly changing perception and understanding, creating a whole new energy of love and wisdom within us. Healing is the most beautiful gift we can gift to ourselves.